This chapter provides a historical perspective and an insight into how the glass-ionomer cement was invented following a long series of studies on dental cements, beginning with the now obsolete dental silicate cement. It reviews the experiments on the predecessor materials and also the early studies of the glass-ionomer dental cement. 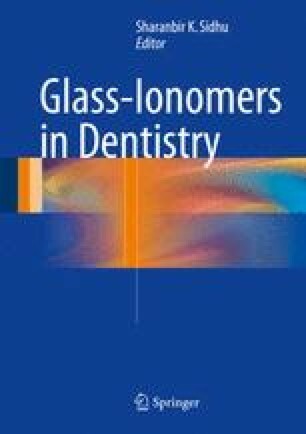 Glass-ionomer cements emerged from research on the former dental silicate cement and the zinc polycarboxylate cement. Dental silicates were poorly understood materials in the early 1960s when studies were started at the Laboratory of the Government Chemist in the UK. These studies showed for the first time that dental silicates were acid–base materials that set to form a matrix of metal phosphates containing unreacted glass filler. From this, the role of the glass was understood for the first time and, in particular, the importance of its alumina/silica ratio in controlling basicity. Following this discovery, the means of producing a practical glass-polyacrylate dental cement was clear and was achieved by altering the alumina/silica ratio of the glass to increase its basicity and balance the reduced acidity of the poly(acrylic acid). The original glass capable of forming a practical cement, known as G200, was high in fluoride and hence fairly opaque compared with modern ionomer glasses. Consideration of the role of fluoride led to the concept of chelating additives to control the setting reaction which led to the discovery of the effect of tartaric acid. This allowed glass-ionomer cements of good translucency for clinical use to be developed. These inventions led on to the pioneering work described in this chapter in which the setting reactions were elucidated, the role of water established, the release of fluoride studied and the factors affecting strength determined. This knowledge informed early ideas of how these materials might be used in dentistry, and the chapter concludes with a review of these early clinical applications.